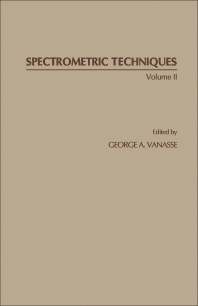 Spectrometric Techniques, Volume II provides information pertinent to vacuum ultraviolet techniques to complete the demonstration of the diversity of methods available to the spectroscopist interested in the ultraviolet visible and infrared spectral regions. This book discusses the specific aspects of the technique of Fourier transform spectroscopy. Organized into five chapters, this volume begins with an overview of the large number of systematic effects in the recording of an interferogram. This text then examines the design approach for a Fourier transform spectrometer with focus on optics. Other chapters provide a brief background to outline the scientific usefulness of Fourier spectrometers and present a calculation giving the optical path difference required to solve a Doppler-broadened spectral feature. This book discusses as well the importance of good mechanical design to minimize sampling error contributions by mechanical mechanisms and resonances. The final chapter deals with photon counting techniques to measure dispersed radiation.